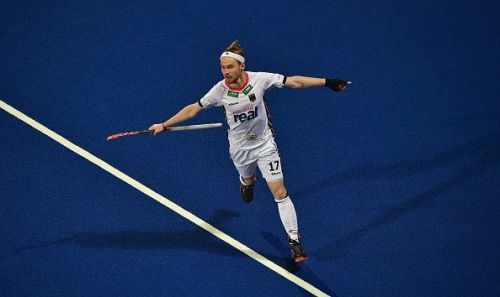 Bhubaneswar, Dec 9 (PTI) Olympic bronze medallist Germany defeated Malaysia 5-3 in a keenly-contested match to maintain their all-win record and seal a direct quarterfinal spot by topping Pool D at the men's hockey World Cup here on Sunday. Germany finished their pool engagements with a maximum of nine points from three games. Tim Herzbruch (2nd, 59th minutes) and Christopher Ruhr (14th, 18th) scored two goals each while Marco Miltkau (39th) struck the other one for the world number 6 Germans. Malaysia's all three goals came from penalty corner conversions by Razie Rahim (26th, 42nd) and Nabil Noor (28th). By virtue of this win, the Germans joined two-time champions Australia, Olympic champions Argentina and hosts India in the quarterfinals. Asian Games silver medallist Malaysia are all but out of the tournament as they are placed last in Pool D with just one point and an inferior goal difference. Only a miracle can save Malaysia from packing their bags. They can still remain in the fray if the Netherlands beat Pakistan by at least eight goals or more. Both the teams had their chances in the game but it was Germany who were more precise with their finishing skills. The Germans started brightly and raced to a 3-0 lead inside 18 minutes through goals from Herzbruch and Ruhr. But the Malaysians tried to make a valiant fightback and managed to reduce the margin to 2-3 in the 28th minute through goals from Rahim and Noor. The clinical Germans capitalised on Malaysia's defensive errors when Miltkau deflected in a Niklas Wellen's perfect lay-off in the 39th minute. The Malaysians did not give up and narrowed down the gap to 3-4 when Rahim converted another penalty corner. The Germans had the last laugh when Miltkau scored from a counter-attack just a minute from the final hooter to dash any hopes of Malaysia's comeback.